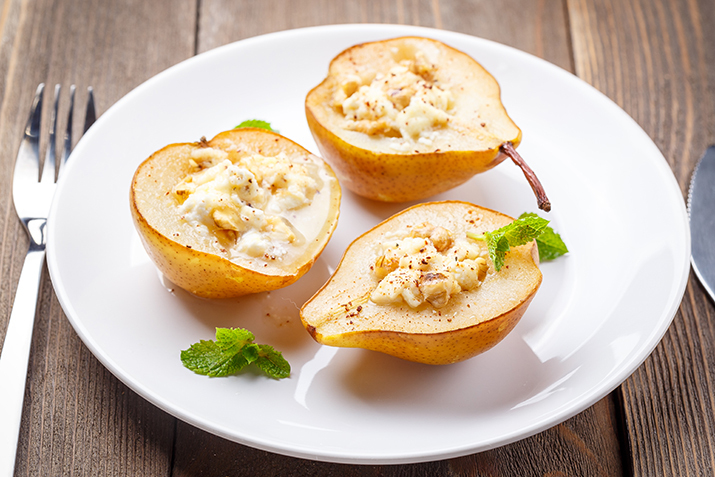 Sweet ripe pears and savory Gorgonzola are perfect match in this simple yet elegant dish. Works equally well as a dessert or an appetizer. Preheat broiler. In the microwave or on the stovetop, heat the honey and balsamic vinegar and stir until combined. Cut each pear in half lengthwise and scrape out the seeds using a melon baller or small spoon. Place pears on a sheet pan, cut side up, and brush with the honey-balsamic glaze (reserve any remaining glaze for drizzling on the pears when finished). In a mixing bowl, blend the Gorgonzola, mascarpone, cranberries, and pecans. Spoon 1 to 2 tablespoons of the cheese mixture into each pear half. Broil the pears for about 3 minutes until the cheese is bubbly. Drizzle with the remaining honey-balsamic glaze and serve. Pair with port wine for a memorable dessert course.